Create a professional presentation by personalizing reports, folders and binders. Self-adhesive holders stick fast to the surface. Card slides smoothly out for easy updating. Clear, durable vinyl keeps your card looking pristine. Conveniently slip your business card into presentation materials or quickly personalize your belongings. 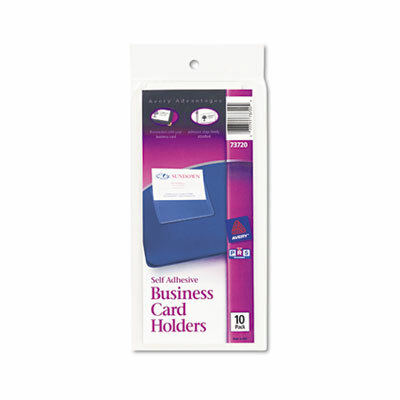 The self-adhesive single-pocket holders stick fast to the surface to ensure your business card stays put. Your card slides smoothly into the holder and can be removed easily for updating. Clear, durable vinyl protects your card to keep it looking pristine for a truly professional display.